Every closet needs a well-designed system for organizing and storing of clothes and accessories. Walk-in closets are often suited for the interior designs of palatial houses. This is primarily because these closets won’t do justice to the floor plans of houses with limited spaces. However, not every house can accommodate a roomy closet. It may seem useful to have a spacious closet since it means you have plenty of space to store your clothes and accessories, but it also means that it is equally easy for things to become disorganized. Lack of proper organization of closets is true for all closets, big or small. It is easier to neglect arranging this area of your house since once the closet door is shut, the disheveled items on the racks and shelves are out of sight, and you can forget about them for the time being. With a perfectly systematized closet, you are more likely to find something to wear more easily, and enjoy donning your favorite attire. In an organized closet, things will be placed in your line of sight, creating clarity, and helping you begin your day with a positive attitude. This can definitely ease the distress that you may face when finding the right outfit for yourself. With a variety of closet organization systems to choose from, you need to select the one that is consistent with your organization style. Arranging this space doesn’t mean you need to make it look like the photos in a furniture store’s marketing catalog. It should serve the purpose of helping you find your clothing, shoes and accessories that you need, when you need them. You should take up this project when you have ample time at hand. So, plan this for a weekend where you wish to stay-in. Do you like to allocate sections to different types of clothes or enjoy a color-coded array of clothes? Do you prefer to hang every clothing item, or find it easier to access t-shirts and jeans when they are folded and stacked? Will your closet have shelves or drawers for foldable items? Do you want the accessories, like purses, belts, scarves and hats, displayed on hooks, or stored away in baskets or drawers? Just like many others, you may have experienced days where you just want to shove all your clothes in your wardrobe, without any order. So, the first step to organizing a closet may not be something that you like. You need to clear your entire closet and take every item out. You may not enjoy the sight of this massive pile of clothes. But, don’t get discouraged because this will look better, once we are through with the process. The next step is to make smaller piles from the big one. You can label these piles as the ‘keep pile’, ‘donate/sell pile’, and ‘cannot-be-used-again pile’. This may be the most tedious of all tasks involved in organizing a closet, and can take hours of your time. Break it up into shorter slots, where you can try on a few clothes before you decide to eliminate them from your wardrobe. 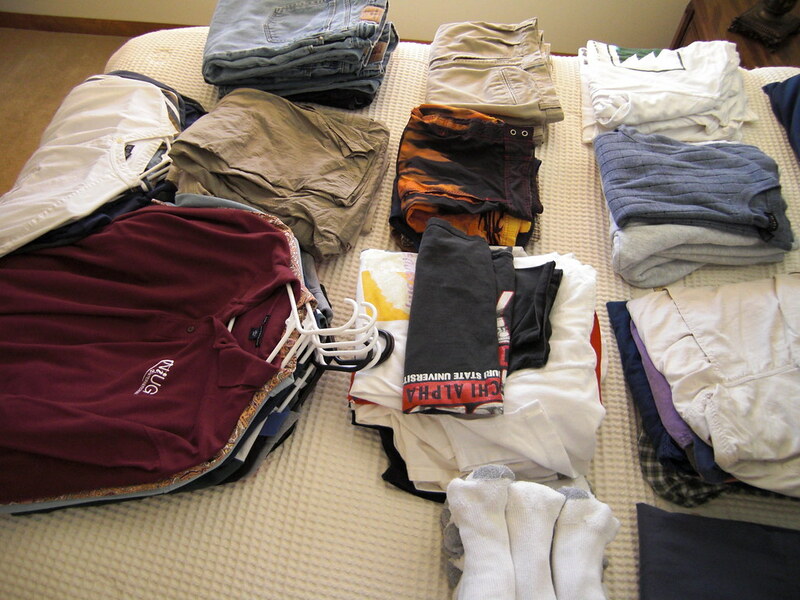 Decide ahead of time what you’re going to do with clothes you want to get rid of. You may pick from three options: donate, consign or trash. We recommend that you take your donation items to your charity of choice. Try to consign the rest of the clothes to people you know and are looking for certain clothing items. Reserve the trash category only for the items that are beyond repair/use. Make sure you keep emptying the trash pile on a regular basis. This can reduce the clutter in the house and create more storage space. The key is to come up with a plan that can help you maintain the order of the closet, so it never becomes a breeding ground for clutter again. Just like for the shelves in your kitchen, arrange similar items together, i.e., all skirts together, slacks together, and knitwear together. 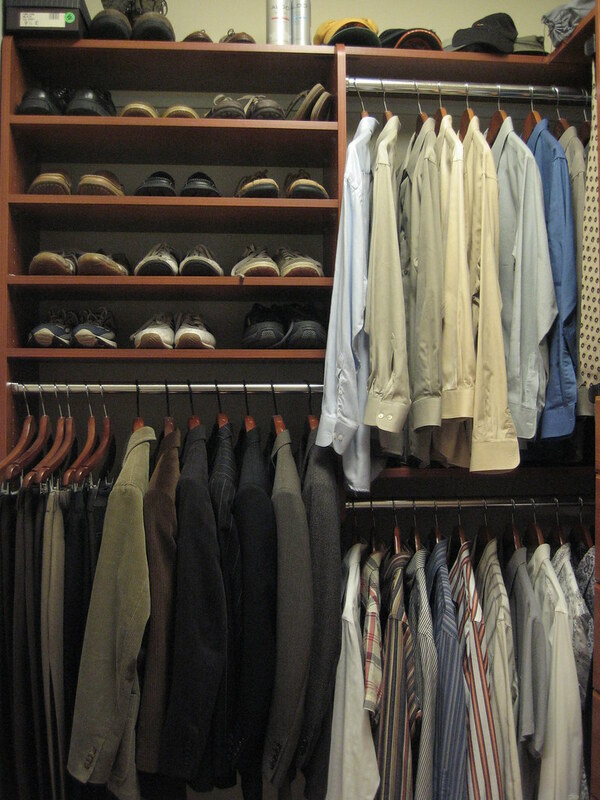 Demarcate the areas of the closet to store different clothes. Within these zones, you can create subsections as well. For instance, in the storage space for tops and shirts, you can have separate columns for long sleeve blouses, short sleeve blouses, fancy T-shirts, workout clothes, etc. When installing rods for hangers, measure the length of your pants, shirts, suits, dresses, skirts, and coats when hung. It is equally important to measure the space occupied by your shoes, including sneakers, heels and boots. With the help of these measurements, you can form a basic guideline for the dimensions required for the hanging section, shelf height, and cubby size for your wardrobe. Group Like with Like: This is one of the key entries in the rulebook for organizing your closet items! Your belts, sweaters, long sleeve shirts, work pants, dresses, button-down shirts, jeans, and shorts, should be grouped with the same type. Some people prefer to segregate the groups on the basis of color. Even this can be a good idea, when you have a large collection of clothes belonging to the same family of colors. Allocate Zones Based on Accessibility: Reserve the front and middle of your closet for clothes you wear most often. For instance, for someone who needs to get dressed for work early in the morning, it will be easier to place the work clothes at the front of your closet so that they are easily accessible. Lesser worn items like swimwear, costumes, and out-of-season attire, should be stored towards the back of the closet or on the upper shelves. Miscellaneous Storage: Use the top-most shelves of your closet to store your out-of-season items and clothes that you only wear a few times a year, like your Halloween costumes or the overtly expensive footwear. Following this rule can help you avoid unwanted lines and creases in your pants and occupy less room. You need to make sure that when hanging the trousers, all the fronts should be facing the same direction. In case you face space constraints in the closet because of insufficient hanging space, you can hang your pants and jeans folded over pants hangers. Go through some of the hanger designs and their utility, if you are not aware of the types of hangers. For instance, a standard clothes hanger will be in the shape of a triangle with a hook on top. Hangers of this design work great for any type of pants. However, you need to be aware that pants can often slip off the hangers. You can opt for wooden hangers or add a strip of velvet, moleskin, or hot glue across the bottom bar of the hanger. This can introduce grip on the hanger and create friction, in turn, keeping the pants from sliding to the side or falling off. You can also opt for pant hangers that have trouser clamps. These clamps will help you hang your pants from the cuff. This is, in fact, one of the best ways to keep them wrinkle free as the weight of the waistband acts as a continuous gravitational iron. Even the smallest of a closet can accommodate a host of clothing items and accessories. All you need is an efficient closet organizing plan and storage solutions. Remember, these closet storage solutions aren’t going to create more (new) space in your closet, and the best way to create more closet space is to declutter the items. However, opting for closet organizers, storage solutions, and closet systems can help to make more storage space accessible to you. Decide where do you want to introduce partitions, so that you can store each category of clothing separately. Also, avoid adding too many of them to the most accessible spots in your closet. With shelf dividers, you can store clothes on shelves more efficiently. No more facing problems of falling-over stacks of shirts and sweaters. A double hang will make better use of horizontal storage space in the closet. You can make better use of the vertical space, as you can hang clothes of different categories on two levels. Further, you can stack your shoes and boots on the bottom shelf. What About the Rarely-Worn Clothes? Use other storage spaces like, the floor, top shelves, or the back of the door, to keep out of season clothing, fancy clothing, and costumes. Along with arranging the intrinsic elements of the closet, selecting the structure of the wardrobe can add to the storage space. The location of your closet and the amount of space you have in the room will determine the best type of door for your closet. Selecting the right door is not just about its design, you want a closet door that gives you easy access to the contents stored inside and is cohesive with the overall décor of the room. Closets in many traditional homes have the reach-in feature, with a simple hinged swinging door or double doors. This commonly used design allows you to store everything within an arm’s reach. In fact, by installing these doors you can increase the storage capacity of your closet by mounting hooks, pockets or racks to the back of the door. You can even use panels of fabric or curtains as your closet door to add color and texture to your room. Another alternative to simple-hinged doors are sliding doors. This design is helpful for rooms with limited walking space. Managing the traffic flow isn’t an issue for closets with sliding doors. One of the major drawbacks of sliding doors is that they allow you to access only one side of the closet at a time. An efficient alternative to both, simple hinged and sliding doors, is a bi-folding door for your closet. 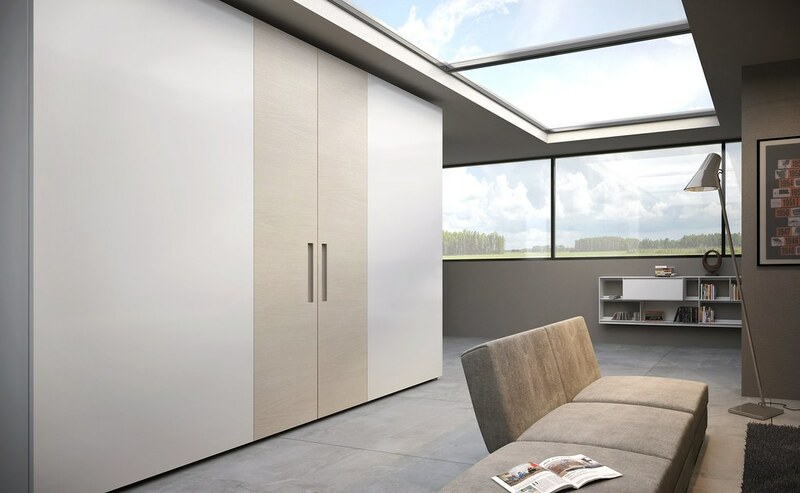 These modern doors are designed to fold back to one or both sides, giving you access to all contents placed across the entire width of your closet. They only take up half as much floor space as a swinging door. You need to be cautious when installing bi-folding doors as they use twice the number of moving parts as sliding doors and may need to be used carefully. hang objects on the inside of the closet door. install pocket doors that are open most of the time. opt for a barn door that slides along the top track. This will offer detailing to your room’s décor. When it comes to storage in the closet, your belts, jewelry, sunglasses, and everything else other than your clothes, require equal attention. Invest in some screw-in hooks and loops from an online or offline home improvement store, and install them on the inner walls of your cabinet space. Remember to drill a hole first and then screwing it in. You don’t want to leave your socks, ties, and other essential clothing items stacked in a pile, when all other objects enjoy designated spaces. Being able to actually see all of them neatly arranged can help you select the best one when you get dressed. Make use of the several storage solutions for accessories available. You can go for a see-through wire bins, acrylic- or glass-fronted drawers, drawers with dividers, or belt and tie racks, to keep these small yet important items organized. Tip: Select shelves and drawers dedicated for accessories that are adjustable and movable within the closet to enjoy maximum versatility. In a house with contemporary home décor, an open closet can be a feasible option and may complement the overall design theme. This style of closet layout can offer more structure, if planned right. 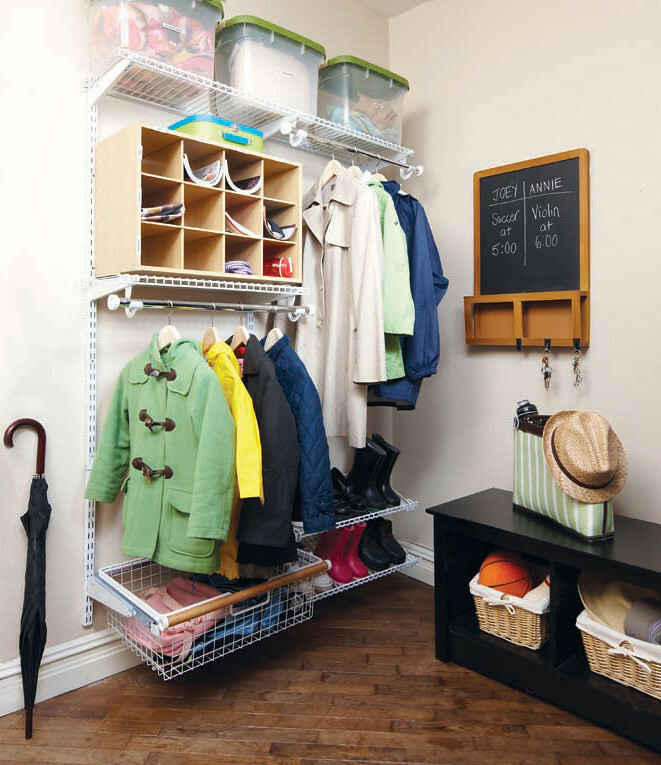 You can include a freestanding rack with several sections and levels to replace a traditional reach-in closet. A freestanding stand can have a separate rack for your coats and jackets, a hanging section for your trousers and jeans, a dedicated space underneath for your footwear, and several baskets to store essentials and accessories. You can also use the space on top to store rarely-used objects, display photo frames, or place a vase for beautification. With multiple storage levels, a mean you will have more space to hang clothes of different lengths and styles, and sufficient space for shoes and accessories. In this setup, accessories and shoes should be stored separately from your clothing, as they may get entwined and it may get difficult to pick them out of the closet. For instance, you may not want to store scarves and sweaters together, because scarves will occupy less space and may get lost among the heavy sweaters. Also, if you own a pair of shoes that you wear all the time, don’t store them in the back of your closet. This may spread the unpleasant smell in all your clothes and other items. Keeping additional storage options in your closet can help you with the tedious work of decluttering your closet. This is because you will have designated spaces to toss the items that you no longer want to wear without stocking them at the back of your closet. When you begin decluttering your closet, think of how you like to get dressed. Do you select your top first, and pair it with a trouser? Or, do you color-coordinate your clothes? Based on the answers to such questions, arrange your clothes to serve you best. Place the most-used items up around eye level, less-used below, and least-used high above. You can use the portable big shopping bags that you may have received from retail stores. Other viable storage options include, cardboard box, a large beach bag, or a bin. Among the most common blunders that people make when arranging their closets is to place an item randomly and say “I’ll just keep that there for now.” Following this habit regularly will only cause more clutter. You will find random clothing items stored all over the place. After a certain point, you shouldn’t be surprised to find some non-clothing items in your apparels closet! Using the closet to store clothes without arranging them, will only make it more difficult to remember where you put them. You will take hours to track a single item down, and eventually lose interest in dressing well for an occasion. This can be worse when you are in a rush for an appointment. One of the fundamental principles of good closet organization is allocating a specific storage space to certain kinds of items, and keeping only that item in that space. 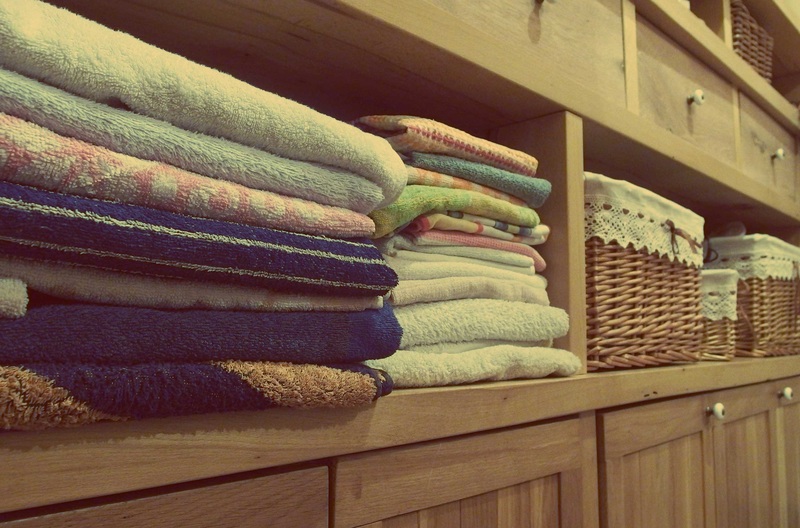 Avoid stacking clothes folded in piles, as this will encourage you to place things without maintaining the segregation. Closets with rods for clothes hangers can help you break out of this habit. Hanging your knitwear is one of the primary causes of stretched out shoulders, waists and formation of divots and puckers, that may damage the look of the outfit. Avoid using hangers for delicate knitwear and try to neatly stack them in a pile after folding, or hang them on a rod. The only exception to this rule is that you may use hangers for tightly-woven woolens. If you are still persistent on using hangers for your sweaters, buy satin hangers that will not put any pressure on the seams or shoulders. Make sure you check these items regularly to see if gravity is stretching the fabric out. Partitions, dividers, baskets, and special boxes are definitely excellent storage solutions and useful in organizing your closet, but you need to be aware that there’s a limit to their usefulness. Hoarding your closet with innumerous of storage solutions can also lead to them taking up all the space. Introduce only those storage options into a small closet that really save space. Large shelving units and racks, are only going to get in your way. Instead, look for slim-line hangers, flat shelf dividers, and small belt holders. Corners of the closet are often mistaken to be wasted space, in fact, you can do a lot with these regions. With proper spacing and a well-thought out shelf design, you can make this area more functional. Leave sufficient space between sections in your closet to allow access to items you use most often. The point of intersection of these sections forms a right angle, you can use these spots as separate top shelves. Consider buying a small shelf unit or install a few hanging racks for the corners of your closet. Just like in most business scenarios, you can employ the Pareto Principle of 80-20 to your closet organization plan. Drawing parallels from the principle, the majority of us only wear 20% of the clothing that we own, for 80% of the time. You can infer from this information that most of our clothes are rarely worn or stored for certain seasons. Plan your closet organization in such a way that it enables you to conveniently access items that you wear frequently and allots specific areas for additional storage. Purchase shelves, hangers, rods and drawers to help you with it. Save the top shelves for seldom-used items such as seasonal apparel and extra blankets. Organizing your closet may seem like a Herculean task, but the more often you invest your time in closet maintenance, the less time it will take. With the right storage options and a smart plan, you can restore order in your closet in no time. A quick cleanup once in a month can help you avoid re-organizing the closet for a long time. 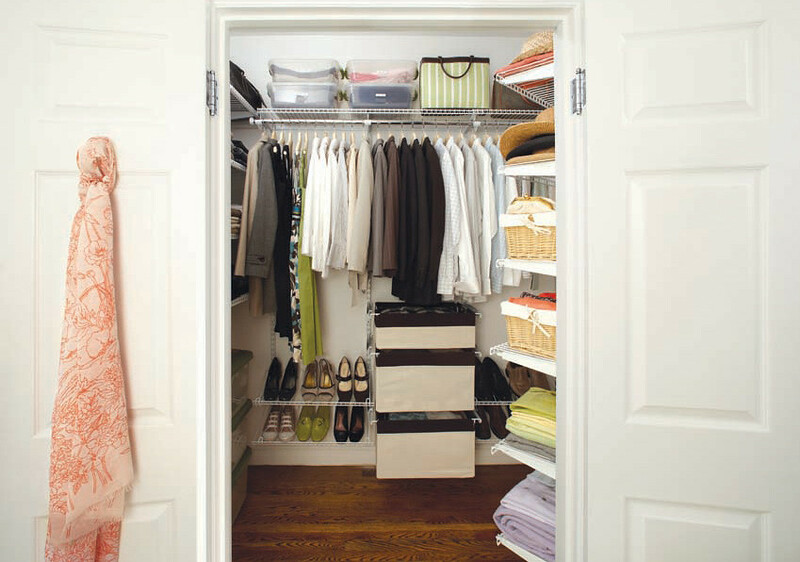 With the above list of do’s and don’ts at your perusal, you can seamlessly implement your closet organization plan. Do tell us how helpful were these tips for you. We would love to hear your opinions, suggestions and experiences regarding organizing your closet. Drop us a message with your photos and tips that you’d like the other readers to know.